Now I will backtrack. In school, athletic prowess was always much admired. You were not considered a well-rounded student unless you excelled in a sport and were on a school team. 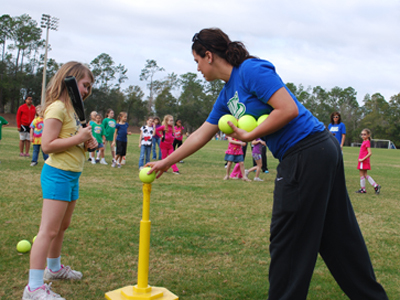 Teachers spent a lot of time encouraging students to “find their sport” because everyone was good at something – you just needed to discover what it was. The whole process was so crushingly public. There were two main forums: gym class (physical education) and field days (track and field competitions). Both were compulsory. You had to try new sports on a regular basis and attempt new skills in front of all your classmates. To be fair, we did have training. In gym class, we’d learn the rules of a sport in the classroom, we’d practice individual skills and do drills, and then we’d be put in a game situation. My marks in gym class were always good because I studied and followed instructions. I just fell apart during the games! There was a third forum for sports that I found the worst: the “pick-up game.” On a sunny spring day, the teacher would announce, “It’s too nice out to be here – we’re going to play ball!” As everyone gleefully raced out to the baseball diamond, I would drag my heels, knowing what was to come: the team picking line-up. For a bookish student, could anything be more humiliating? The teacher would choose two athletic all-stars to be team captains. Each of them would pick a student to be on their team. Of course, they would choose the next most high-performing athletes. Each team would alternate choosing players until only a few were left. The last to be picked were kids with physical disabilities and bad athletes. I was one of the latter. The team captains would look at each other and roll their eyes and make the best of a bad situation: “OK, you take Dar and I’ll take Tim,” and we’d follow our new team mates as the captains sighed. Now the captains and the other students genuinely wanted us to do well. They wanted to win! When we were up at bat, they’d give us all kinds of tips and encouragement. We’d feel all optimistic about getting a hit – which made it worse when we let down our team. Bases are loaded and Dar is at bat? Fuggedaboutit! As I let the team down, everyone was supposed to think, “It’s only a game and we all tried our best.” But in actuality, no one was a good sport. My team was embarrassed and angry, not just for the team but for me. The other team gloated. The teacher would publicly give me pointers on what I should have done or could do next time. The other bottom-tier athletes and I experienced this several times a week or month for the ten years of mandatory Phys Ed. The system didn’t change. We didn’t change. It was self-perpetuating. You can’t even imagine my relief when I finally reached Grade 10 and Phys Ed wasn’t compulsory any more. Needless to say, I did not subject myself to gym class for my last 3 years of high school. I did care what my classmates thought of me. Why did I never improve? First of all, I wasn’t interested in team sports and never played them outside of school. The neighbourhood kids played ball and pick-up games of hockey; I had no interest. Without practice, I never developed a “body memory” for any athletic moves. I was also a somewhat solitary child, satisfied with a small number of friends. I didn’t have a team mentality, and didn’t know how to get one. I didn’t like the way teams showed aggression to each other during a game, even if they shook hands afterwards. In a perverse way, I was self-assured: I knew I was good at some things (like reading and academics) and there were other areas in which I would never be good, like sports. That was just a “given” to me. And although I cared about what my classmates thought, I didn’t care enough to want to wow them by being the Most Improved Athlete. I often think about my experience with Phys Ed and I wonder how it could have been made better for students like me. I think the curriculum was on the right track by providing a huge range of activities, by teaching skills, providing coaching and drills, and providing support and encouragement. One thing that worked against me is that Phys Ed teachers often devalued academic achievement. They saw gym class as a place where the more athletic, less academic students could shine. Some of them openly delighted in seeing an “A” student fail at sports and get their comeuppance. They saw it as levelling the playing field. Many of them highly valued team work and didn’t like it when students were individualistic. Now I see that Phys Ed teachers were powerless to “make” students be inclusive and kind to each other. They can put the structure in place, and make students outwardly comply, but they can’t make students like each other. Exaggerated competitiveness feels like intimidation – and often is. When I was about 16, I had a Eureka moment. I overheard one friend talking to another. C said, “You’re good at everything!” and R replied, “No, I’m not, I just don’t do the things I’m not good at.” That was me – not that I was so good in everything, but I definitely didn’t like learning new things and doing new things in public view. I liked to read and practice privately, and emerge accomplished! I was quite a perfectionist and didn’t like displaying my shortcomings, especially if I knew they’d invite ridicule. I am not sure about the responsibility of school in such things. If it were up to me, I would have quit gym class at age 9, never to return. I did learn about “active healthy living” in the following years, and I did enjoy some of the sports and activities, so it would have been a loss. But I would have liked a greater emphasis on fun and play, and less on achievement. Just being active and playing tag or skipping would have worked! Or (conversely), instead of changing activities every month, we could have been given a choice of 2 or 3 sports and practiced them for a whole semester, to feel a real sense of accomplishment. Or, we could have chosen from paths like “fitness,” “team sports” and “creative movement.” Maybe even in multi-age groups. So did I turn out to be a total gym dud? Yes in Phys Ed, no in life. My swimming lessons at the lake every summer morphed into a job as a swimming instructor. I got into fitness and even liked aerobics and weights for some years. I liked hiking and skating and roller skating, and still do. But despite the efforts of some caring teachers, my years in gym class were more of a hindrance than a help to me. 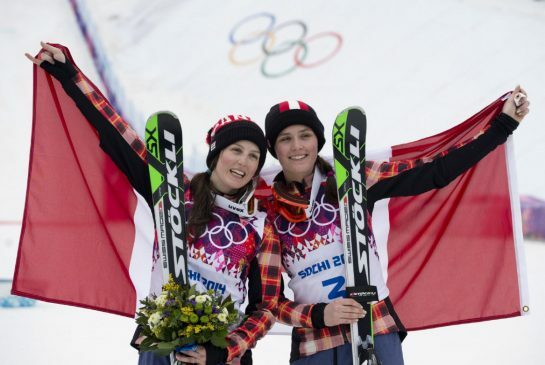 This post is dedicated to the Canadian women’s and men’s gold-medal curling and hockey teams! Oh my… I can totally relate to sucking in gym class – I was always picked last for kick ball and could NEVER finish those horrible running tests. But the funny thin was that I wasn’t really un-athletic – I just couldn’t deal with the pressure-filled situations. It wasn’t until I was in jr. high that a friend clued me in to the problem. For some reason whenever I tried to do some sort of physical activity I would close my eyes and hold my breath, sorta like I was jumping into a pool or something! And speaking of pools, don’t EVEN get me started on the horrors of swimming lessons! Anyhow, it took me years to figure out how to put it all together, and finally in high school I became a “star” softball player on my recreational league. I had the best batting average in the league and was actually considered a valuable member of the team. Then, when we were playing in the state tournament, I stood up too quickly while catching a ball in center field – I have low blood pressure, and all the blood ran out of my head and my vision went black. Fortunately I had lined myself up perfectly to catch the ball – unfortunately my glove was about an inch too low. Long story short I caught the ball in the face and spent 2 weeks in the hospital, and had to undergo a terrible ordeal to have my nose fixed. And that was the end of my very short stint as a sports star. Sigh. Oh Cat, what a tale! But I am glad you’ve had the experience of knowing how it feels to excel in sports! And I know you must feel good now about your cycling. Ha! I loved sport in school…did everything…and now? Nope! Knitting is the extent of it! oh and walking the dog! Why do you think that is, Holly? Too cold out? LOL! I was mediocre at sports – my two best performances were in the long jump and high jump and I wasn’t a bad goalie in hockey. I would have enjoyed dancing and yoga but neither on offer at school. On cross countries when it was really cold me and my two best friends would lag behind then separate ourselves from the class and run down the hill through the wood across the road and along the lane to my house where my mum would feed us beans on toast before we had to run back to school! No one missed us and we looked forward to those cross country runs. Ha ha! That sounds like my kind of sports! Dar, I was reading almost all of myself in your post .. except I never became a swimming instructor. Well, it was a brief career (two summers) but it did give me some body confidence. Are there any fitness activities you do now? Only the thrice-weekly workouts at gym and the Sunday walks around the neighbourhood. Like you, I prefer solitary activities. I’m a pretty awkward/clumsy person in general so team sports weren’t my thing either. The gym teacher never let us pick our teams (I would’ve been picked last for sure) and I avoided all team sports at recess. But thank goodness my gym classes were structured differently than yours. 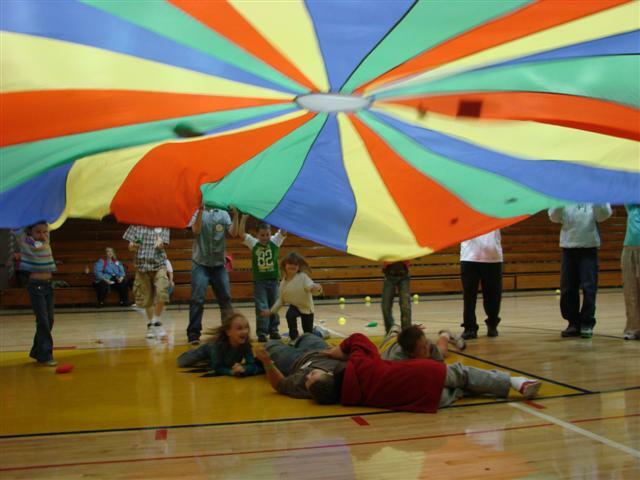 Gym class was always focused on fun for me as a kid – we did play with that parachute thing pictured! We also had a lot of “centers” (all the way through high school) where the teacher would give us choices and we could pick what we wanted to do. For example, for a week we might have the choice of a basketball game, the weight room, or walking/running laps around the perimeter. I never became proficient in anything, but I did avoid embarrassment! OMG, Amanda – your gym classes sound like a dream – I would have loved that! Sadly the Phys Ed curriculum has not changed that much here and Link had to go through some of the same nonsense I did, but Link didn’t embarrass easily, and stood up to the teachers quite often too! Ugghhh! Me too!!!! I *hated* Phys Ed at school and dropped it as soon as I could, after Year 10. I am really interested to read your take on it: how the ultra-competitiveness worked against the real goals, including “being able to win/lose well”, “acquiring healthy lifestyle habits”, being a “team player” etc. I agree completely that there could be a change to the curriculum / pedagogy to improve things. As a teacher, I also wonder if that’s similar to how a percentage of students feel about the subject I teach (French.) I keep trying to imagine what it’s like for those who don’t instinctively like languages….another subject many ‘drop’ as soon as they are able to. So right! I was very aware that the way I felt about being up at bat or being jeered at the finish line, was exactly the way some other kids felt about having to read aloud in class, or being called up to the chalk board to do a math problem. And those were subjects in which the outcomes really mattered. PS – Almost all the staff I meet in libraries have had horrible gym experiences – when we talk about it, it’s like we’ve found our tribe 🙂 We spent school with our faces inside books! I was a pretty terrible athlete as well (maybe not being a good athlete correlates with being a blogger!). However, We had PE as well as compulsory sport on Saturday mornings, and I actually liked the sport better because I was part of a team (always the bottom team!) and we usually supported each other. We did the same sport for a whole term, so that helped us improve. I have never been part of a team that played together for a season – that must be a good feeling. I was not a terrible athlete. But my childhood was not without similar humiliations. I lay in bed thinking of my upper primary school PE teacher the other night, and scolded myself for thinking less than kind thoughts of her, with my recollections of those years. I was in the netball team, the A team, I swam, I tried out for (and was not selected) for softball, and I ran, played tennis (mum insisted on lessons, I hated them and dropped it quickly). I wasn’t great at running, but I did well in ballgames – an interschool competition!! Nonetheless, my memories are of being chided for tardiness to training (at 10yo, living on campus, whilst I was nearby, managing life (eating, washing, schedule) isn’t a breeze even for organised me), humiliated for not being in the softball team, annoyed at not being picked for water polo (which I took up privately as I aged, and as you know, still play and LOVE) and basically feeling inadequete. When I started high school, I stayed in the ‘A’ netball team, til I felt sick with the exclusiveness of the whole thing, and quit to learn and play volleyball instead. I’m so glad I moved away from the legacy of primary school, and the clique of netball!! I wondered what your experience might be like, and whether expertise in sport would have been valued and “expected” at your school. I’m not sure if I would have fared better at a girls’ school (if there had been such a thing) – probably not, because of the exclusion thing. It sounds like you made some conscientious choices that suited you well! And I’m glad you still play for the love of it. I don’t know what it feels like to be that active; I can only imagine. But despite gym class, I did find my own way. I really value being strong, too. In fact I am wicked strong, especially compared to people’s view of me! Sounds exactly like my PE memories. Ugh, awful! Wouldn’t it be nice if there were tiered PE classes? Some for those who like competitive team sports, some for those who just want to engage in some physical activity? Yoga! Wouldn’t it be wonderful if yoga were offered? Hi and thanks for stopping by! It’s funny you should mention yoga. My child struggled with gym class in junior high school, but for the compulsory credit in grade 10, the school system did a pilot of offering yoga! It was a life saver, and has since become an accepted permanent option. It seems they finally realized their goal of “active healthy living” could be achieved by something other than competitive sports. I loved PE at school, but I was very sport orientated – I played field hockey at a good level well into my twenties. At school I was that person who was captain of the hockey and the netball team, but put me in the gym and it was a horror show for me! I never understood why I had to do it. It would be much better if you got to choose what you wanted to do – although I fully understand why physical activity is something that is encouraged. I agree, and to some extent I was glad I was pushed into SOME physical activity rather than none. I suppose the catch was that there was never any choice, so you had to go through weeks and months of struggling with a sport or activity in which you had no hope of improving. Funnily enough, we did maybe a two-week unit on field hockey, which I have never played since, and I quite liked it! Looks like you’ve been scarred by your gym classes! And so have quite a few others. Fancy librarians being gym class escapees! Who’d have thought it! Lol. Anyway, I’d fit right in with you. I was actually a teacher-librarian for a number of years and never saw, and still don’t see, the point of team sports. Give me a book, not a ball. Our gym classes seem to have more options for recreational sport. My sons did tenpin, tennis, rock climbing, indoor soccer, ice skating for non-competitive sport at school. But most gym teachers don’t seem to have an understanding of those who are not into sport. Hope I am not the same with kids who can’t read! I’m not naturally ‘sporty’- although I don’t remember PE lessons being too horrific, I think because although I was not particularly fit or talented at sports, I wasn’t scared of the ball, or scared of running about getting sweaty (which was a step up from pretty much all of the other ‘not sporty’ girls, who would flinch and duck rather than catch/hit etc any sort of ball coming in their direction! I’ve never really played team sports, and these days I run (once a week) walk (which is the majority of my exercise) and horse ride. Oh, and do yoga as well. I think yoga being taught in schools would be fantastic- it is so calming and centring, just what you need when you are a stressed teenager! Oh, to have had a choice! Your program sounds really good and I hope the educational system someday realizes that there are different ways of learning physical ed, just like there are different ways of learning reading and math. Wow I hadnt thought of the “team picking line” in ages. And yes, I was usually the last one picked because I couldn’t throw a ball to save my life! Likewise – or hit one!